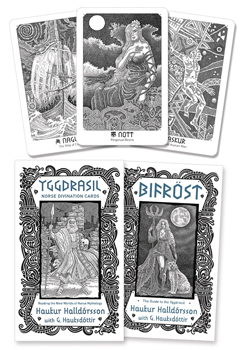 Based on the fascinating mythology of the Nordic traditions, this 81-card divination deck brings the stories and characters of ancient Scandinavia to life. Artist Haukur "Hawk" Halldorsson's intricate pen and ink drawings are powerful representations of the most important characters and symbols of the Eddas, the ancient writings of the Norse. These cards, along with the convenient guidebook, are designed to be used for divination, guidance, and spiritual connection. Created by one of the greatest living authorities on Nordic spirituality, these cards are a welcome addition to those who desire a deeper relationship with Odin, Freyja, and the rest of the Nordic pantheon.